past several months and was officially certified as a Delivery Agency on Tuesday, March 8, 2016. Wade, Chief of North Lenoir Fire & Rescue. facilities in a 53 square mile district in northern Lenoir County. The department consists of 3 stations, 10 pieces of apparatus and more than 50 volunteer members that respond to approximately 300 requests for assistance per year. KINSTON, NC (Lenoir) – North Lenoir Fire & Rescue Chief Brian Wade has been named the 2016 Volunteer Fire Chief of The Year by the North Carolina Association of Fire Chiefs. The award is the most prestigious honor the NC Association of Fire Chiefs can bestow upon a Chief officer and was conceived to recognize truly outstanding Fire Chiefs whose actions and leadership in their profession, home, community and country, serve as an example and challenge for all other Chief fire executives throughout the southeast. fire service that can serve as a model to others,” said Chris Decker, NLFR Public Information Officer. where he rose to the rank of Lieutenant before leaving to take a position with the NC Office of State Fire Marshal in 2013.
dedication, and sacrifices that have been made for our district and the fire service,” said Franklin Floyd, NLFR Treasurer. award among such a great group of individuals is an honor and a very humbling experience,” Brian said. Chiefs Southeastern Fire Chief of the Year. emergencies or exposure of dangerous conditions created by either man or nature. 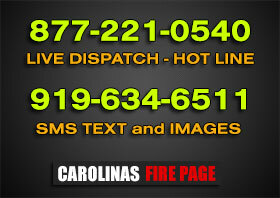 FireNews.net would like to that NLFR PIO Chris Decker for sharing this information.